Some years ago I had the good fortune to swim with and photograph a group of Northern fur seals (Callorhinus ursinus) at San Miguel Island, the northernmost of the Channel Islands offshore of central California. I was there on a multi day tank diving trip. Blessed with fantastic weather, we were able to anchor the boat amidst thick kelp beds offshore of San Miguel’s Point Bennett pinniped rookery. Most divers immediately put on tanks, dropped straight down without even looking around the boat, and scoured the bottom looking for bottom stuff until their air ran out. 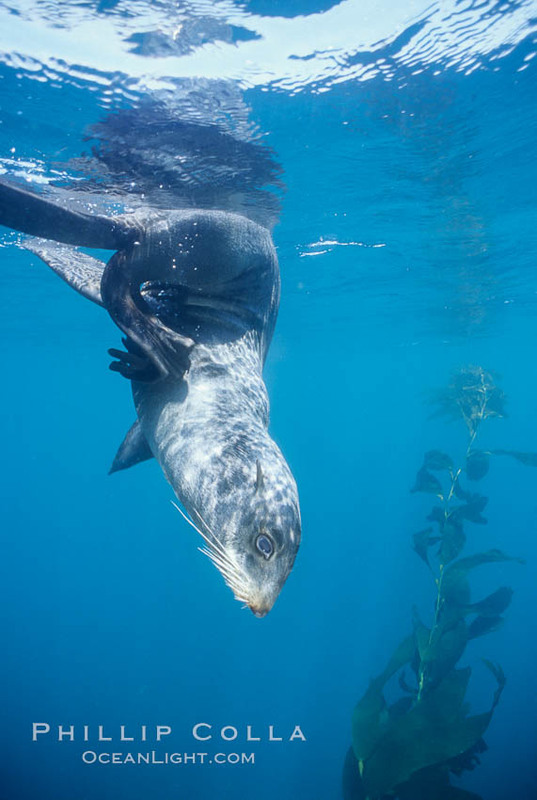 While suiting up, however, I noticed a small group of strange looking pinnipeds rafted up about a hundred yards away, a type I had not seen before. I could not identify them through binoculars but could see that they somewhat resembled Guadalupe fur seals (Arctocephalus townsendi), a species I had dived with many times at Guadalupe Island, except that these seals were smaller and had a distinctly different head profile. The only thing I was certain of was that they were not California sea lions (Zalophus californianus). Curious, I left the tank on the boat, swam over to the seals with just fins, mask and camera, and spent about two hours freediving alone with them. At one point an enormous submarine passed by me, clearly much larger and different than the seals I was with. The thing was huge. It took me several moments to realize that what was blotting out the sun was a passing male Northern fur seal, and that the smaller ones I had been photographing all this time were females. The water was not great, but clear enough that was able to get four keepers out of the three rolls that I shot. Once I returned home and reviewed the photos I could confirm that my seals were female Northern fur seals. Indeed, the description of the distinct sexual dimorphism in the species was consistent with the sizes of the seals I saw in the water, particularly the huge male. 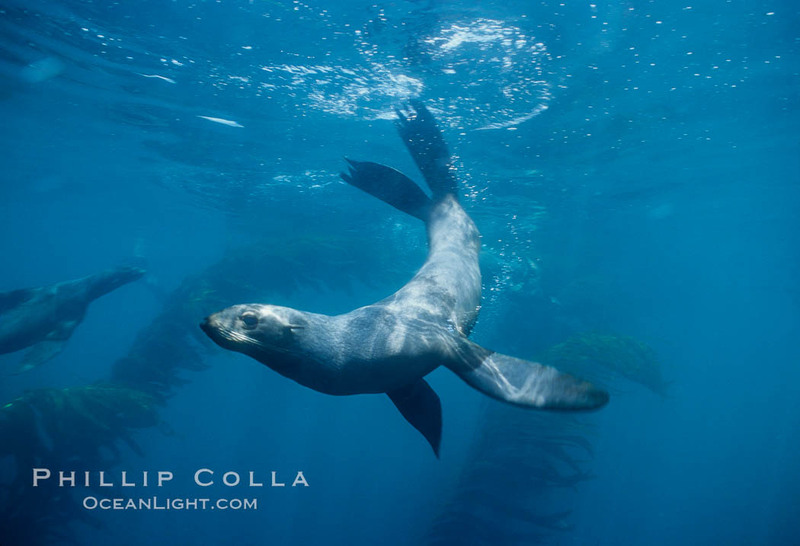 Northern fur seal swims through the cold waters and kelp forest of San Miguel Island, in California’s northern Channel Islands. The bulk of Northern fur seals reside in the Pribilof and Commander islands far to the north in the Bering Sea, ranging around the Pacific to the Kuril Islands north of Japan. At the opposite, extreme southeast extent of their range is a small rookery at San Miguel Island, the home of the seals I observed. 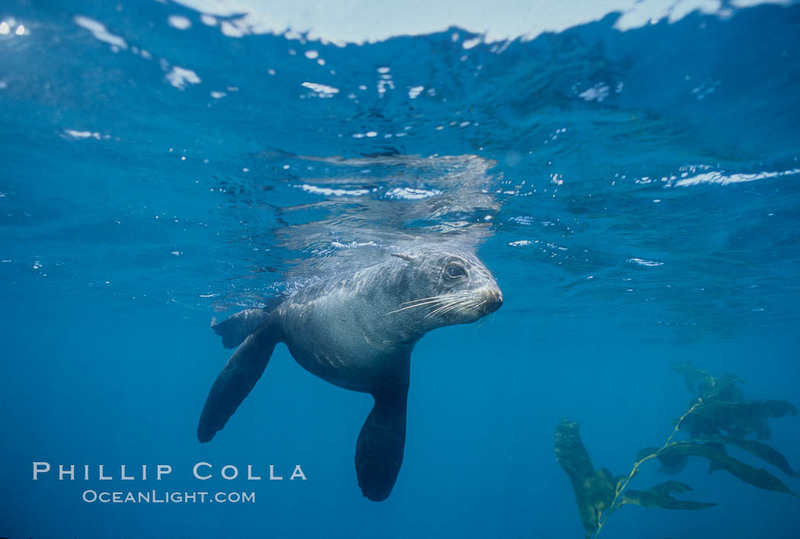 Mine was a particularly special encounter since few people ever swim with Northern fur seals, much less have conditions favorable enough to photograph them. However, none of the other divers on the trip showed interest in joining me even though I implored them to when I returned to the boat twice to change film, insisting this was a rare opportunity. I do not dive San Miguel Island anymore these days, and have not seen another Northern fur seal since then.